The most recent Society awards, as approved by the ASCE Executive Committee, include honors for a former Region 8 Governor and a rehabilitation project in Burbank, CA. 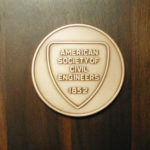 • ASCE President’s Medal – Marc A. Edwards, and Roger M. Millar Jr.
ASCE accepts nominations throughout the year for various awards and honors. Oct. 1 is a major deadline, with 19 different honors cutting off nominations on that date. Learn more about each award and submit a nomination, or email awards@asce.org.